I have been in business now for 33 years restoring antiques, custom making furniture to order and manufacturing one off woodworking jobs, although more recently I have been concentrating on propeller manufacture, refurbishment and aircraft restoration , trading as Sovereign Restorations from my workshop at my home in Coventry , UK. 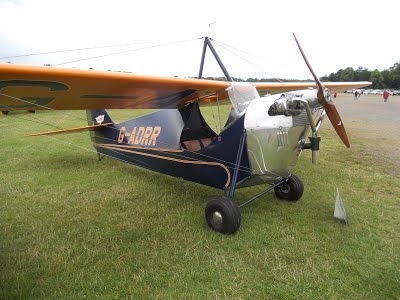 She flew in her debut airshow at Old Warden in September 2015 along with the other Hawker Cygnet G-CAMM and the ANEC G-EBJO, She regularly participates in the Shuttleworth flying displays often flying with our Aeronca C3 G-ADRR, with either Rob Millinship , Scott Butler or Mark Sharp flying them. Our Aeronca C3 G-ADRR which myself with help from my brother Mark have restored to flying condition, was built in 1936, also powered by a JAP J99 engine ( a licence built Aeronca E113C ). Imported from the USA in 1989. Kept in storage until we acquired her in 2013. She flew last year for the first time since 1948 ! Again with Rob doing the test flying .The permit was issued in October 2015, She has now flown in many displays now . Both aircraft are based at The Shuttleworth Collection at Old Warden Aerodrome and can be seen in their museum along with their rare and unique aircraft , vehicles and agricultural machinery. Cygnet in my house ! Above right is a photo of The Shuttleworth Collections Sopwith F1 Camel , of which I made the propeller. I have refurbished many wooden aircraft propellers , recently the Miles falcon G-AEEG needing total strip down , recover and paint , replacement of damaged copper leading edge . My latest acquisition 1939 Heath Parasol G-AFZE , ( the only surviving British example) complete with Bristol Cherub lll engine , rescued from a Surrey residential garden, in a very poor state, but complete, I intend to restore her back to flying condition . I also make wall hanging decorative propellers, exact scale replicas with clock or barometer inserts, in various woods , which are for sale on my stall at the Shuttleworth Collections flying displays , some are for sale in the visitors centre at Old Warden Aerodrome, they can also be purchased by mail order , please contact me ( details below ) for more information, stock list and prices .